AVZ Minerals has achieved a record 341.62m intersection from the Manono lithium project in the Democratic Republic of Congo (DRC). 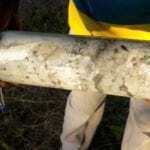 The intersection, from the 406m long hole MO18DD009, returned strong lithium and tin results across the body of the Roche Dure pegmatite. 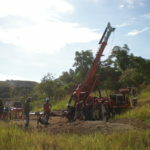 AVZ, which owns 60 per cent of the 188-square-kilometre Manono project, said the intersection, the largest ever achieved at the site, included a large upper interval of weathered rock of 302.10m at 1.54 per cent lithium oxide and 875 parts per million (ppm) of tin. The other 40 per cent of the Manono project is split between state-owned La Congolaise D’exploitation Miniere SA, which owns 30 per cent, and Dathomir Mining Resources, which owns the remaining 10 per cent. Adjacent fresh-rock interval drill hole MO18DD012 returned results from 268.75m of 1.55 per cent lithium oxide and 751ppm of tin. A third hole located a little further from the other two, MO18DD015, also returned strong results of 1.58 per cent lithium oxide and an impressive 1053ppm of tin from a 278.86m interval. 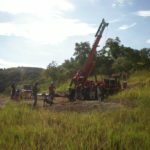 The figures build on similarly strong results returned earlier this month and could prove promising for AVZ’s upcoming maiden JORC mineral resource estimate, which is expected in July. AVZ managing director Nigel Ferguson said the project was continuing to produce excellent grades of both lithium and tin. “This bodes well for the calculation of the maiden JORC compliant mineral resource in July and ongoing drilling for the complete pegmatite body and updated resource calculations,” he said.